Rather than grasp at the low-hanging fruit of bolstered horsepower numbers or other easily digested figures that play well outside of the larger story, Mazda showed us that their engineering efforts were focused in the right places – designing a great chassis, getting the car’s weight down as low as possible and, perhaps above all else, retaining the core values of what made the Miata such a sensation to begin with. When they finally took the wraps off the car late last year the results certainly looked promising, but a stat sheet and the experience behind the wheel don’t always sync up the way one might expect. It would be more than half a year before we’d get our chance to see what the new Miata has to offer first hand, but we’re happy to report that the latest MX-5 was undoubtedly well worth the wait. What is the idea behind the 2016 Mazda MX-5? The original MX-5 started rolling off the production line in Hiroshima back in 1989, nearly a decade after auto journalist Bob Hall posed the idea to Mazda to produce a small two-seater inspired by classic British roadsters like the Lotus Elan and Triumph Spitfire. The concept was fairly straightforward – develop a light weight, rear wheel drive platform that focuses on the joy of driving above all else while maintaining bulletproof reliability and a low cost of ownership – something the cars that inspired the MX-5 were never particularly successful at. While the market in the late 1980s wasn’t exactly chomping at the bit for a car like the MX-5, the Miata went on to become the best-selling two seater convertible sports car in history, with nearly one million examples built to date. Beyond the car’s fun-to-drive nature and accessibility, Mazda’s engineering efforts yielded a fantastic canvas for a race car as well, and the MX-5 has gone on to become the most popular production vehicle for amateur motorsport in the U.S. by a wide margin. This is a legacy that Mazda is understandably proud of, and while the lion’s share of Miata owners have historically been older folks looking for a toy for a weekend getaway, retaining the fundamentals that drew serious enthusiasts to previous MX-5 models has clearly been at the forefront of Mazda’s decision making process when designing the fourth generation “ND” Miata. 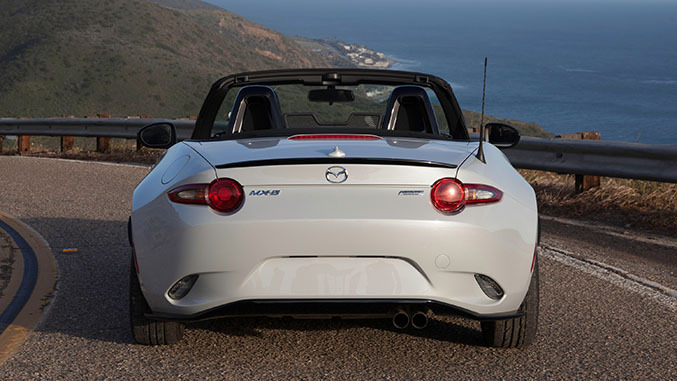 While the Toyota FR-S and Subaru BRZ twins are the only relatively close competitors that come to mind – despite neither being available as a drop top – Mazda didn’t phone this one in, as the painstaking process of bringing the new car into reality makes a lot more sense once you realize just how much the automaker scrutinized the details. In these horsepower crazed times we live in it can be difficult to convince people to get excited about 2.0-liter four cylinder engine that generates 155 horsepower and 148 pound-feet of torque, especially when faced with the fact that those numbers are down from its predecessor. But considering that this naturally aspirated mill can get the new MX-5 to 60 mph from a standstill in 5.8 seconds, or nearly half a second faster than the FR-S, BRZ or even the turbocharged, 178 hp Mazdaspeed MX-5 Miata could muster – all while returning fuel economy numbers of 27 city and 34 highway – the performance is undeniably impressive in context. And it sounds the business as well, providing a subtle version of the buzzing snarl that Miatas are known for. 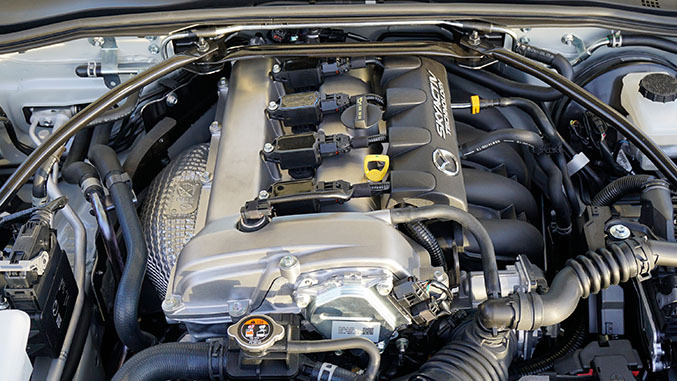 While the MX-5’s straight line pull has never been tuned to set your hair on fire, the 2.0-liter motor is an eager driving companion with good low end pull and a linear power band as you ascend through the revs. Available for the first time in the U.S. with a six speed manual gearbox as standard (a six speed automatic is optional), the MX-5’s short gear ratios make it a riot to drive hard, and you don’t have to venture into the far reaches of sanity to get there. The shifter is a pleasure to operate, as is the easily-modulated clutch, and the pedal layout makes rev matching as hassle free as you could hope for. Mazda has been fairly adamant since the official debut of the new MX-5 that turbocharging has not been under serious consideration for future high performance variants of the car. Instead, they intend to focus on ways to further reduce weight and eke out a bit more power without resorting to forced induction. At the helm of the new car it’s easy to understand why, as the car feels impeccably balanced, and the introduction of more weight to the front of the car as well as the potential sacrifices to throttle response seem like a poor tradeoff for the sake of a few extra ponies. Time will tell of course, and the ND Miata’s projected ten year production run offers a lot of opportunity to create a multitude of variants. How does the 2016 Mazda MX-5 handle? 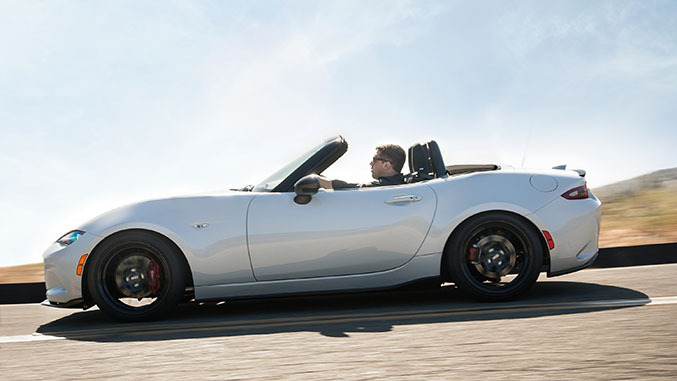 The ND Miata is more than 150 pounds lighter than its predecessor. In fact, there are configurations of the new MX-5 that are actually lighter than certain configurations of the original first generation car, despite the inclusion of an array of additional safety features and various luxury appointments. The weight of the 2016 MX-5 Club model is now under 2300 pounds, making it nearly 500 lbs lighter than the FR-S and BRZ, and it shows. The MX-5 truly feels tossable and nimble. 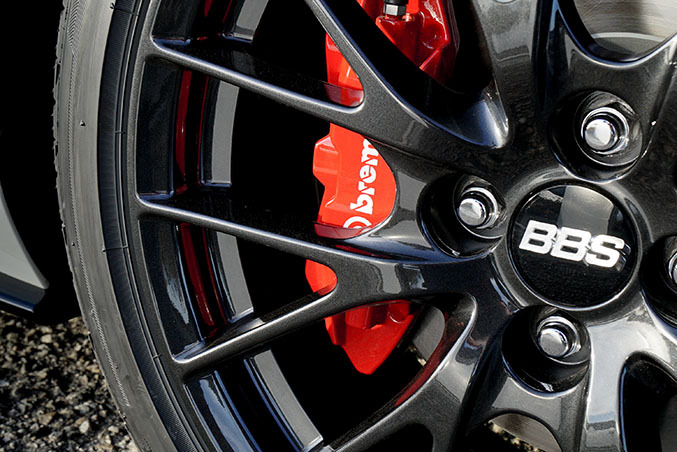 With the Club model’s limited slip differential, BBS wheels, Bilstein dampers, strut brace and Brembo brakes, the effect is even more pronounced. News of the ND Miata’s transition to electrically assisted power steering had some concerned that the latest MX-5 would suffer from steering that lacked feel, but Mazda’s engineers opted for a rack-mounted system rather than a system implemented on the column specifically to address this potential issue. It seems to have done the trick, as the new car’s steering feels remarkably communicative for an electrically-assisted system, though it’s not quite on par with a manual system (as Mazda suggested) like the Alfa 4C’s. Interestingly, despite the Club being the most sport-focused among the trim levels offered, the car exhibits a fair amount of body roll when driven hard, though Mazda say that’s another method they’re using to enhance the emotive nature of driving joyfully. We’d probably recommend at least looking into some meatier sway bars if you’re planning on spending a significant amount of time with the car on the track, though it’s certainly up to the task and will entertain on the road course as-is from the showroom. How are the design, fit and finish when you see the car in person? There’s been some mixed feelings about the masculine aesthetics of the new MX-5's Kodo design language. Some suggest that the car’s former lack of visual aggression was a nice change of pace from industry trends, while others applauded the added visual drama of the new car. We find ourselves in the latter camp, and we’d go as far as to say that the new MX-5 looks fantastic, retaining the model’s DNA from previous generations while looking thoroughly modern and compelling. Inside the story is much the same, with a much more modern design that falls closer in line with the handsome and clutter-free interior layout of cars like the Mazda 3. 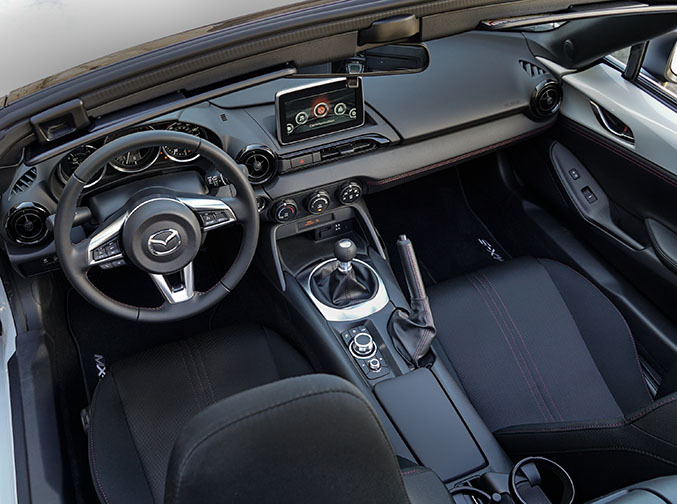 Similarly to the 3, none of the switchgear or materials feel noticeably cheap and the Mazda Connect touchscreen infotainment system remains one of the stronger offerings in the industry, especially at this price point. It might seem rather trivial, but the MX-5’s one-latch convertible top system was one of our favorite features – opening the top is simply a matter of releasing one latch and locking the top down into place behind your head – a process that can be completed in about 3-5 seconds (see it in action at 2:20 in the video below). Perhaps it’s because it is one of those elements that indicates just how much care and attention Mazda’s designers and engineers gave the new car during its development. When Mazda set out to put the first MX-5 on the road, their mission was to capture the joy of driving and they were wildly successful at it. Now, more than two and half decades later, their mission with the fourth generation car was to recapture the core elements of the original car while thoroughly modernizing the MX-5 at the same time. And again they’ve exceeded expectation. Are there quicker cars out there for $30,000? Sure. But as the Miata has illustrated countless times, fun can’t always be quantified by acceleration or top speed numbers, and fun is why we became obsessed with sports cars in the first place.